How does Y-DNA differ from Autosomal DNA? An autosome refers to the remaining 22 numbered chromosomes that a person inherits from each of their parents. With each generation back, the amount of DNA you inherit from an ancestor is reduced. So the amount of DNA you share with a first cousin is much greater than is shared with a fourth or fifth cousin. After several generations the amount of DNA passed down becomes negligible. Autosomal testing is called Family Finder on FTDNA.com. It is also available on 23andme.com and is the only DNA testing done by ancestry.com. I have already tested autosomal DNA, why do I need to test y-DNA? If you have already tested autosomal at AncestryDNA, Family Finder at FTDNA; MyHeritage or 23andMe this is very useful for certain situations. However, autosomal testing has its limitations. As discussed above, autosomal DNA is inherited from both parents. If you look back at your 5x great-grandparents, all your autosomal DNA is made up from contributions of those 128 different individuals. And the amount you inherit from each ancestor is less and less with each generation further back, to the point of being negligible and of no benefit in determining relationships. Additionally, the amounts of autosomal DNA passed down is random, so you may not share any DNA with a fourth cousin, but possibly share DNA with an eighth cousin. The graph below represents the DNA you inherit from your ancestors. Autosomal DNA is represented by the gold color. Since the y-DNA, shown in blue, is not split with each generation, it can aid in determining relationships many-many generations back. Can DNA tests I have done with other companies be transferred to FTDNA? Instructions for autosomal transfers may be found here at FTDNA. Additional information about y-DNA transfers may be found here at FTDNA. Every male individual who takes one of the Y-DNA tests will also receive their Y-DNA haplogroup. When humans left Africa tens of thousands of years ago, they departed in small groups that migrated into different parts of the world. Over many generations, each group developed distinct mutations allowing for identification of one from the other. These groups of mutations are called haplogroups, and they can tell which migratory routes our paternal ancestors traveled. What does Clade and Subclade mean? Clade comes from the Greek word Klados, meaning branch. A Clade on the Y chromosome tree is also called a Haplogroup. Subclade describes a sub-clade being downstream (occurring later in time). A Clade includes all the descendants of a single MRCA (most recent common ancestor). A marker is what is tested in the basic Y-DNA tests. These markers are also referred to as STRs (Short Tandem Repeats) which are a series of repeating nucleotides (A, T, G, C). For example: GACTACTACTACTGG - the STR consists of the three repeated CTA segments. Y-DNA tests look for matching markers or “STRs” between two men, if they match, which would indicate a genetic relationship. Genetic distance is the term used to describe the number of differences or mutations between two sets of Y-DNA STRs test results. A genetic distance of zero means that there are no differences in the two results and there is an exact match. If you are looking to begin Y-DNA testing, the Y-37 Marker test will allow you to become familiar with Y-DNA results. However, if you want to know more about your paternal line through matching, you will want to start with a Y-67 test. The Y-111 test will be of most benefit for those looking to confirm Y chromosome matching at the highest level between two living men. The difference between the Y-37, Y-67 and Y-111 tests is that more markers (STRs) are analyzed which allows for more refined results including matches. The Big Y-500 is for expert users, it will provide 100K SNPs and additional STRs, however these markers will not provide more refined matching. Do I need to order a new kit for add-ons and upgrades? If you have already purchased a DNA kit and submitted a sample, there is no need to order a new kit—FTDNA will use your existing DNA sample that is stored for any additional test(s) that you order. In the rare instance that there is no further DNA available for testing on your existing samples, FTDNA will send an additional collection kit, associated with your original kit, to you at no charge. Why do I have Y-DNA matches with different surnames? This is a common question that is asked when people first get their Y-DNA results. And there are several explanations for it, such as surname changes, adoptions or other non-paternity events. There are instances were children take their mother's surname. It is also possible to have a common ancestor that lived before surnames were in use. See this site for additional explanations. Mitochondria are in the cytoplasm of most human cells that serve as the body’s energy factories, and they have their own DNA called mitochondrial DNA or mtDNA. Only mothers can pass mtDNA to her children. So, like y-DNA, mtDNA is relatively unchanged with each generation. UPDATE: New research shows that in rare cases some mtDNA is passed from fathers. Article here. However, the Genetic Genealogist asserts that this occurrence is extremely rare and will not affect genealogical research. Because a mother passes mtDNA to both male and female children, both men and women can be tested. 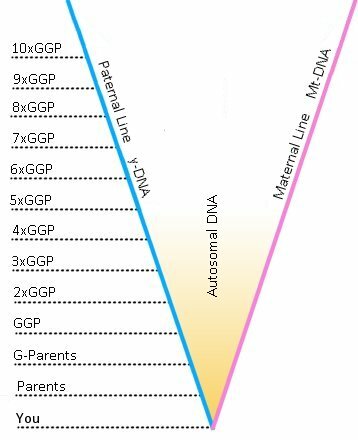 mtDNA tests are used to trace your direct maternal lines. So it’ll go from your mother to your grandmother to your great-grandmother and so on. The complicating part of studying mtDNA matches is that surnames change with each generation. The Ralston Project welcomes anyone with Ralston heritage who has done mtDNA testing to join; however, our primary focus is y-DNA as this is most beneficial in tracing the Ralston lineage.